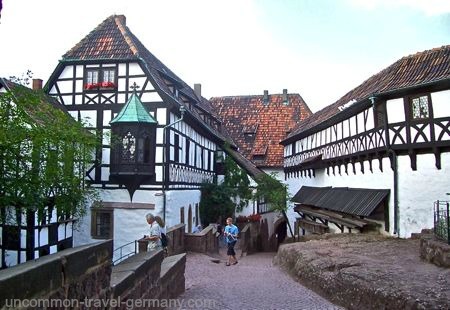 Wartburg Castle is Germany's real fairy tale castle and possibly the one most-loved by Germans. 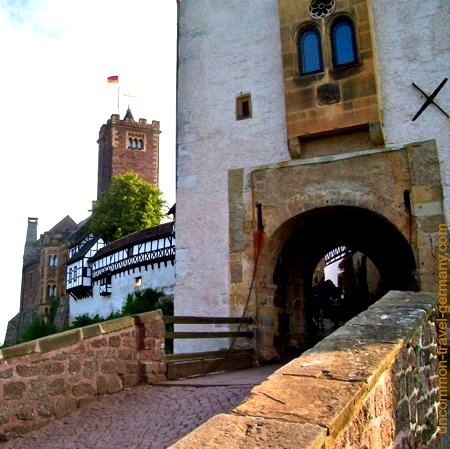 This castle is not only beautiful and properly medieval, its walls are thick with German history and legend. It is on the list of UNESCO World Heritage sites. Wartburg Castle was built in 1097 by a Frankish count, Ludwig I of Thuringia, and has survived structurally intact to the present day. There are three main historical events associated with the castle: Martin Luther hid from the Inquisition here for a year during 1521-22, Saint Elizabeth was the mistress of the castle from 1211 to 1228, and the legendary Meistersinger Contest, dramatized by Wagner in the opera Tannheuser, allegedly took place in the Troubadours' Hall in 1206. 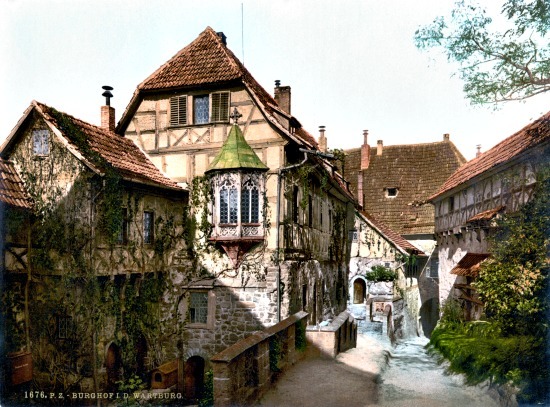 The Wartburg's most famous resident was Martin Luther who came here after he was declared a heretic and sentenced to death by the Holy Roman Emperor. Luther grew a beard and called himself Jünker Jorg (Squire George) living incognito under the protection of one of the German princes. He spent his time in a rustic study, translating the Bible into German, fighting depression and and arguing with the Devil. 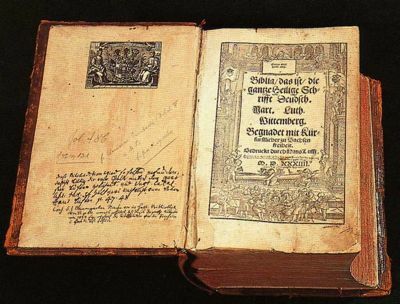 His powerful translation became the basis for the standard German of today. The little Hungarian princess who would later become Saint Elizabeth, was betrothed to the owner of the Wartburg, Count Ludwig III, in 1211. She was only four years old when she arrived here and was married to the Count at the age of 14. After six years of marriage (and four children! ), she was a widow at 20 and devoted the rest of her short life to helping the poor. Various miracles have been attributed to her including the Miracle of the Roses. 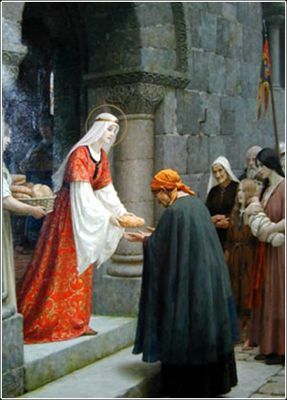 The story goes that she was walking down a road with an armload of bread to give the poor, when her husband, the Count, came riding by. He didn't approve of her charitable activities and had forbidden it. He asked her what was hidden under her shawl. When she opened it up to show him, there was no bread, only a bunch of roses. She died at the age of 25 from "exhaustion" having worked herself to death while living a very austere life. She was canonized soon after and became a very popular saint. The Order of Teutonic Knights adopted her as their patron saint and there are Elizabethekirche (churches) scattered all over Germany. 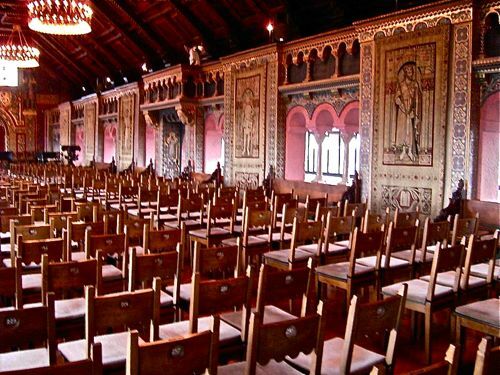 It was in the Troubadours' Hall (Sängersaal) of the Wartburg in 1206 that the legendary Contest of the Minstrels between the German minnesingers, or troubadours, took place. Count Hermann I of Thuringia and Saxony was a patron of the arts and declared a grisly competition of the best minnesingers of Germany (the Meistersingers). The loser was to be put to death. Six minnesingers competed in verse. Five of them praised the Count but one, Heinrich von Ofterdingen, praised his Austrian master in Vienna. The count was not amused and ordered the execution of von Ofterdingen. Countess Sophie interceded and Heinrich was granted a one year reprieve. Through various magical devices, including a magic carpet and a hell-hound, the loser was whisked away to Hungary. He returned a year later and was pardoned, in part because an ally foretold the birth of the Hungarian Princess Elizabeth. The winner of the contest was Walther von der Vogelweide (1170-1230), considered to be the greatest German poet of the Middle Ages. Richard Wagner based his opera Tannhäuser on this story. 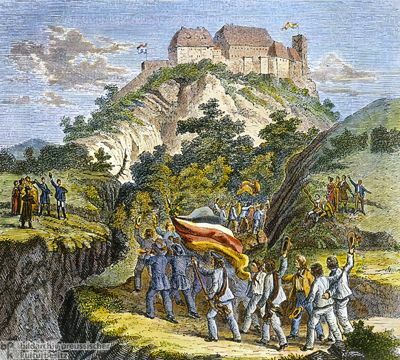 More recently, in 1817, a festival at the Wartburg attended by over 500 German university students turned into a political rally demanding the unification of the German-speaking people and the democratization of the government. Nothing really came of it until years later, but it was an indicator that the winds of change were blowing through Germany. The flag of one of the fraternities that was hoisted at the Wartburg that day ended up being an inspiration for the current black, red and yellow flag of Germany. 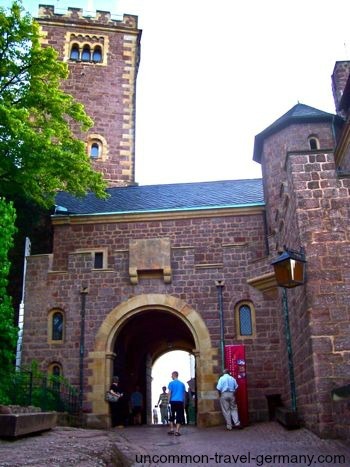 The Wartburg is a big castle; allow at least two hours to explore it. From the battlements there is a sheer drop with a spectacular view of the surrounding forest and town of Eisenach. There are two courtyards, a three-story palace, a collection of half-timbered buildings and a large cistern for the castle's water supply. The entrance gate is massive and properly sinister-looking. 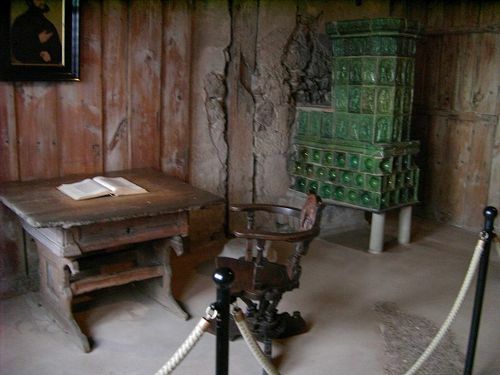 Martin Luther's study is located in one of the half-timbered buildings that enclose a rather cosy-looking courtyard. The room where Luther did his writing is kept just as it looked at the time. 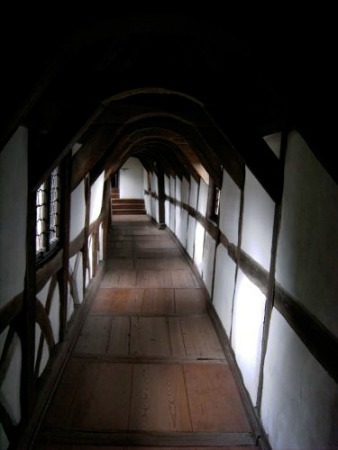 The walls and floor are rough planks and his window looks out over the inner courtyard. There used to be a stain on the wall where Luther supposedly threw his ink bottle at the Devil (later found to be a more recent addition), but so much of it was scraped off as souvenirs it is now just a hole near the heating stove. The palace or Residence of the Counts is in a three-story building towards the rear of the castle complex. This part of the castle can only be seen as part of the guided tour, but it is a must! All but one of the daily tours are in German, but they provide a very detailed brochure in English that covers the same information. The English tour is daily at 1:30 p.m. The interiors are stunning. 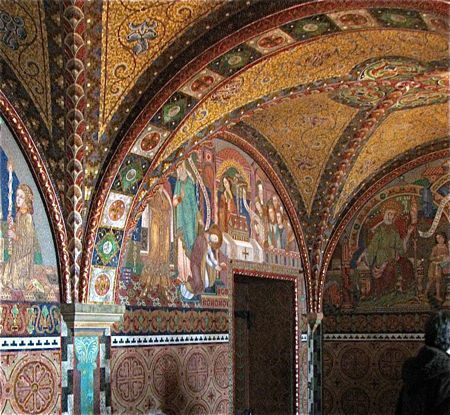 The structure of the rooms is unchanged from the Middle Ages, but around 1900 the walls were decorated with mosaic tiles, paintings and tapestries. Although a bit controversial, the additions are undeniably magical. I've seen many castle interiors, but the Wartburg's are truly spectacular. In Elizabeth's Boudoir, the charming vaulted chamber is completely covered with small tiles made of colored glass. 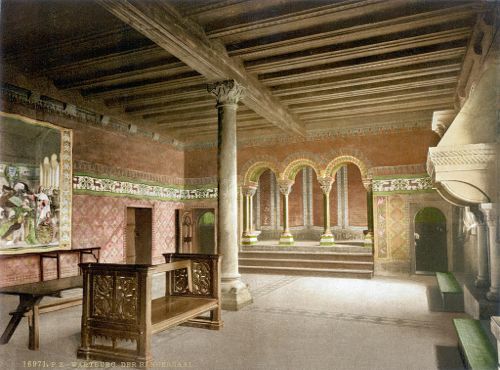 Both the Landgrave's Hall and the Troubadours' Hall are beautiful as well, with carved wooden columns and murals depicting the history of the castle. The Banquet Hall (Festsaal) is vast and lined with ornate arches, and the coffered ceiling is impressive. Mad King Ludwig of Bavaria had a room created at Neuschwanstein castle inspired by both the Festsaal and the Saengersaal of the Wartburg. It's fun to explore the well-preserved passages of the Burghof. The castle grounds and Luther's room are open daily 8:30 to 8 (Nov-Mar 9-5). Guided tours run daily from 8:30-5 (Nov-Mar 9-3:30). There is one daily English tour at 1:30, year round. The Wartburg is sitting on a large hill just outside the town of Eisenach, in eastern Germany. It is walking distance if you don't mind a 30 minute walk from the town, most of which is uphill and rather steep. If you've got the stamina for that, it's a pretty walk through a hilly residential area of Jugendstil villas built at the turn of the century and then a forested, steep climb to the castle. Otherwise, you can take Bus #10 or #13 from the train station just outside the Altstadt in Eisenach. There is a parking lot at the base of the castle, and then a 500 foot walk uphill, but there's a shuttle bus for those with impaired mobility. In summer, children can ride a donkey up to the castle. 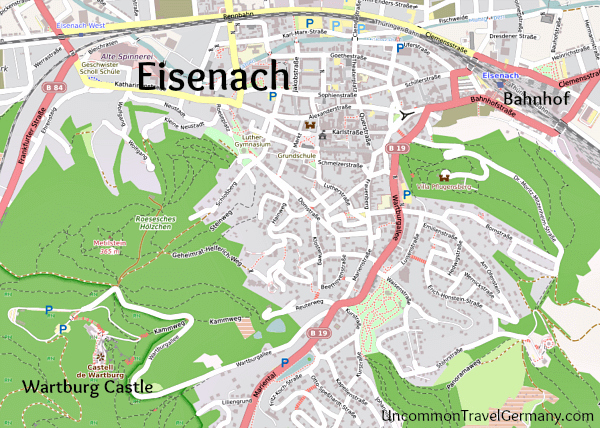 The town of Eisenach is worth exploring as well. 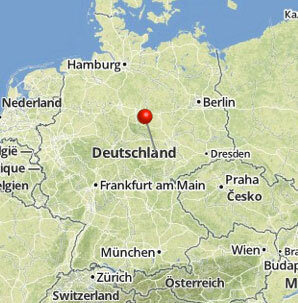 Johann Sebastian Bach was born and raised here, and Martin Luther boarded here as a schoolboy. The Bach Museum is very well done, and there are interesting collections for both Wagner and automobile fans to investigate.